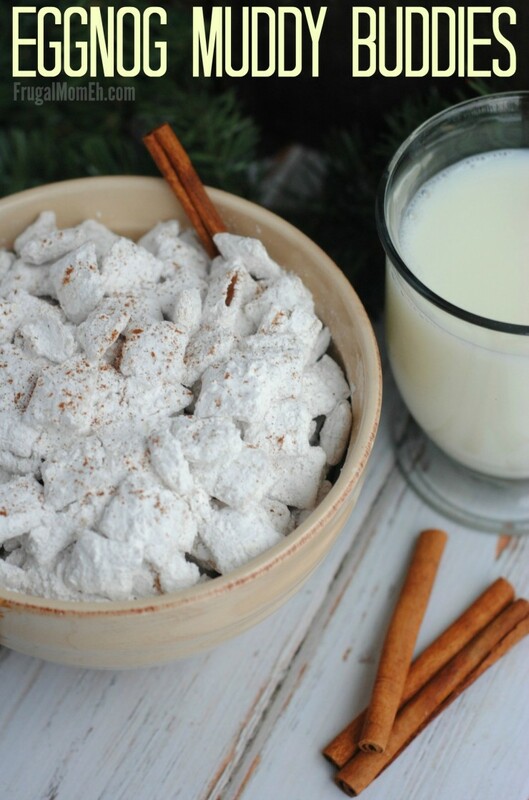 Eggnog Muddy Buddies - Frugal Mom Eh! Eggnog, what would the Christmas season be without it? 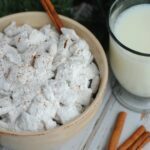 These Eggnog Puppy Chow aka Muddy Buddies celebrate the unique flavour of Eggnog with a favourite treat. They store well for up to a week but I doubt they will last that long! 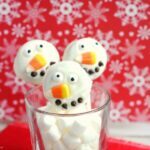 These are perfect for Holiday Parties or just a homemade treat around the fireplace. You may find yourself stocking up on Wilton Eggnog candy melts just so you can make it year round. Yum! #1. Pour the (2) packages of eggnog candy melts into a large microwave safe dish and heat in 30 second increments, stirring every 30 seconds until melted. Set the melted candies aside and allow it to cool a few minutes before pouring over the cereal. #2. Pour the melted chocolate over the Chex mix and stir well completely coating all the cereal. #3. Add the 4-5 cups of powdered sugar to the Ziploc bag (a paper bag will work too). Add in the 2 tsp of cinnamon and 1 tsp of nutmeg. Mix together. #4. Slowly pour the cereal into the bag, close and shake well to completely coat the powdered sugar mixture. Store in an airtight container up to 1 week – we like to keep ours in the fridge. This looks really yummy!! I will have to hunt out those melts! Yummy! 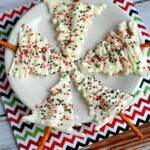 I haven’t seen the Egg Nog candy melts yet – but I am sure they are good! well these I just have to try!! egg nog candy melts sounds so good, not sure where I can find some? What a fun recipe! But where did the name Muddy Buddies come from? I have never had puppy chow, this looks like an interesting treat. 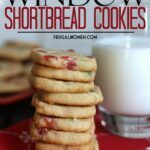 Thank you for sharing this recipe.. I have never heard of eggnog muddy buddies. 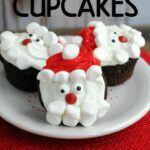 I think my husband would love these and I may need to make him these to surprise him. Thank you so much for sharing. Hmm, great idea! My kids will surely love these! I have never seen anything like these. Granted, I’d never even heard of Eggnog candy melts before! Oh yum! These sound delicious 🙂 I hope I can find the eggnog flavored ones to recreate this! This would be delicious. Thanks for the recipe! 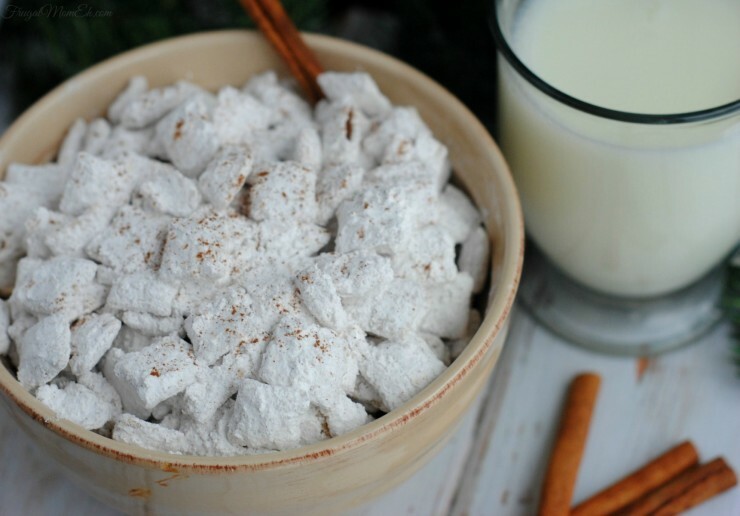 Eggnog Muddy Buddies look good! I haven’t tried Wilton Eggnog candy melts. They sound delicious too. I really enjoy eggnog — this looks like such a special treat! Yum, what a tasty treat!! I have a girlfriend who loves eggnog and I am saving this recipe to make for her at Christmas time. I am not a big fan of eggnog but will definately try this. This recipe I just may like for myself also! It does look good and yummy. this is the first I have heard of eggnog Eggnog candy melts. I will have to check out bulk barn the sell that brand of stuff there. My daughter sent me the Egg Nog Wilton Candy Melts so going to make this during the holiday ! !